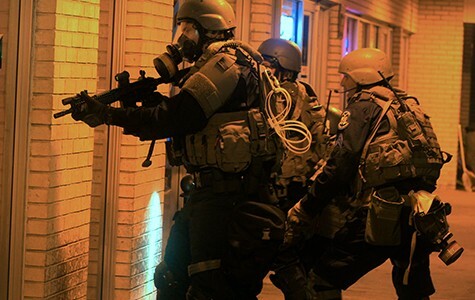 Provocative doc investigates America's police arms race. Directed by Craig Atkinson. Opens Friday. Craig Atkinson's documentary Do Not Resist elaborates on something many of us have seen with our own eyes. For years now but especially in the wake of the 9/11 terrorist attacks, local police forces in the US have been loading up on heavy weapons and equipment, as if they're preparing to fight a war. Atkinson files his opening dispatch from the front lines of Ferguson, Missouri, in August of 2014, as residents take to the streets to protest the fatal shooting of Michael Brown by Officer Darren Wilson. Brown was African American, like most of the people confronting the authorities on that hot summer night, with lightning flashing in the sky. Wilson is white, as were the majority of police in that St. Louis suburb. The cops are armed to the teeth, and Atkinson's crew captures terrific footage of the tense skirmishing while SWAT teams roll in aboard armored personnel carriers and tear gas is launched at the "rioters." Community onlookers tell the camera they think more police killings are coming in the future. It strikes us that we've seen this geometry of basically unarmed demonstrators versus gladiatorial troops before. 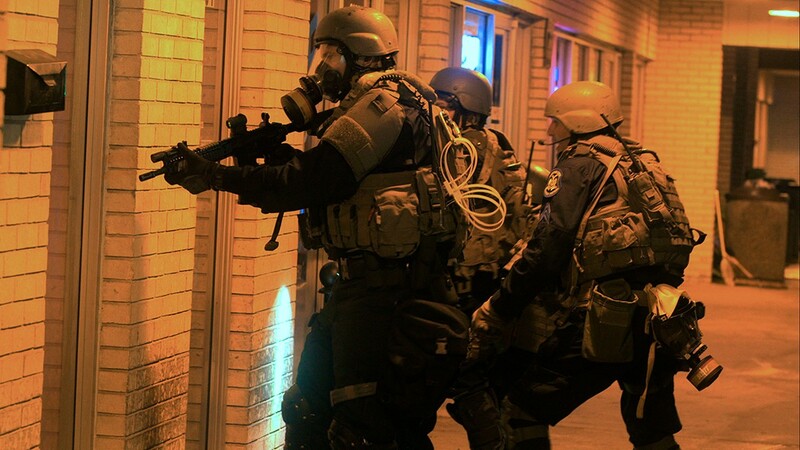 The Ferguson police — in common with their colleagues in South Carolina, Philadelphia, and Los Angeles also featured in the film — bear an uncanny resemblance to the similarly armed US forces in Iraq and Afghanistan. Watching a blitzkrieg drug raid going down in Richland County, South Carolina — smashed windows, money and property confiscated, looking for marijuana — it isn't much of a stretch to imagine law enforcement combatants visualizing the public as The Enemy. Thus, ordinary American citizens suspected of crimes, or even peacefully seeking redress of grievances, could be put in the same category as hostile "Hajjis" in the eyes of militarized enforcers. And thus, be fair game. Director-cinematographer-editor Atkinson (he shot the scintillating Detroit doc Detropia) visits the SWAT games at the International Police Chief Convention in Orlando, where the talk is of "securing this country" against a "metastasizing and changing threat." Dave Grossman, an ominously hawkish security consultant and proprietor of his own police training seminar, tells his listeners that "we are at war," and exhorts them to "fight violence with superior violence." In their efforts to stay on top of the situation, local departments have allies in high places. Ever since 1965, when the LAPD deployed the first SWAT team, US government money and material have been flowing to neighborhood cop shops in a steadily growing stream of laws (the PATRIOT act, etc. ), grants, programs, and most visibly, "surplus" weapons and vehicles such as the MRAP (Mine Resistant Ambush Protected), a Brobdingnagian war wagon returned home from service in Afghanistan and Iraq. Concord, New Hampshire, pop. 42,900 (murders since 2004: two), received a federal grant for a Bearcat armored vehicle. At the Red River Army Depot in Texas, miles of decommissioned MRAPs (at $1.2 million per) stand ready for police use. Since 9/11, Homeland Security has given American police departments $34 billion in equipment grants plus $5 billion in free military equipment — including, in one case, two combat vehicles for a rural department with only one officer. And then there are the issues of aerial surveillance, facial recognition systems, and "forecasting malfeasance." As always, the big question is: What exactly are local police and sheriffs being armed and trained for? Do Not Resist is an audacious examination of an especially troubling aspect of the ongoing militarization of the US. See it and draw your own conclusions.